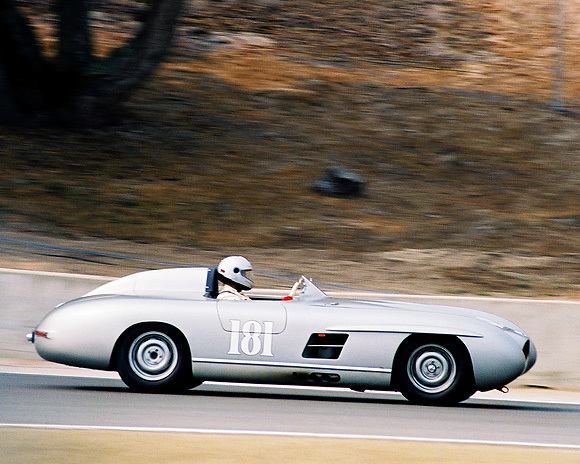 Hans Kleissl -- 1956 Mercedes-Benz SLS "Porter Special"
Dr. Klaus Lehr, of Weinheim, Germany, brought this important piece of California racing history to 2002's Monterey Historics. I've been waiting for the Chuck Porter Mercedes Special to show up since historic racing began. Lehr restored it to its earliest version, with a 3247cc. Mercedes-Benz 300-SL engine. In its glory days with Bob Edmison and others driving, it was known as the "Mercedes-Corvette" with 5700cc's of full-race Chevrolet power. In that configuration it had the performance of a Scarab and challenged for main event wins at Riverside and elsewhere. Debby Porter's Tribute site to her father -- Chuck Porter! "While doing a Google search on my name, I found your site. I wish I had known about it sooner! You have some photos which I haven't seen of my Dad's car, which was cool to see, and it was great to read William Culkin's story about his dad's ownership of the car. The car was originally silver, and when I was about 3 or 4, we were at my dad's bodyshop, and he asked me: "Should we paint the car silver, or yellow?" And I picked yellow. Not that he wouldn't have painted it that color anyway, because everything in his fleet was Goldenrod Yellow! Anyway, thanks for a great tribute, and for the reference to my site. I will link people to your site from mine, as well." Marco Kaffenberger, nephew of Dr. Klaus Lehr, created this new website dedicated to this interesting car!